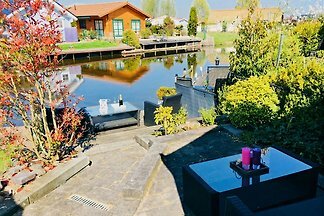 Beautifully furnished, detached chalet within walking distance of the Oosterschelde with a sandy beach and forest. Free Wi-Fi. Dogs allowed. Non smoking chalet! Beautifully furnished, detached chalet within walking distance of the Oosterschelde with a sandy beach and forest. Spacious garden with veranda at the house. Garden sets and 4 seasons smoking grill / BBQ available. Storage in the garden to possibly place your bicycles. Parking at the chalet. Dogs allowed, the garden is completely fenced. Non smoking chalet! Restaurant in the park. The area is very good for hiking and cycling. The living area is 82m2. Because of the many windows it is a nice bright chalet. There are doors to the porch. 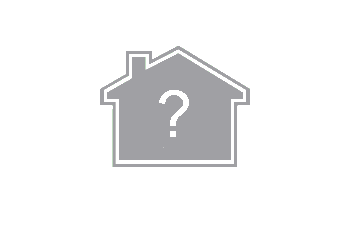 2 bedrooms, 1 with a double bed and a wardrobe and 1 with 2 single beds and a wardrobe. The living room has another 2 person sofa bed. The spacious living room has a large dining area and plenty of seating for relaxing. 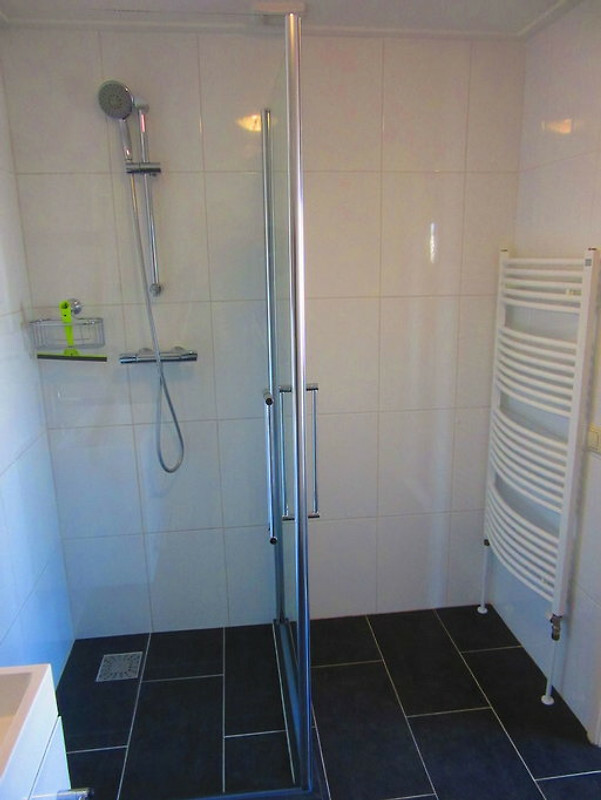 The bathroom has a walk-in shower, sink, toilet and designer radiator. The kitchen is equipped with fridge, microwave, oven, coffee maker, kettle, 4-burner gas stove, pans / dishes. The chalet is equipped with Wi-Fi and offers an extensive range of German channels for television as well as for the sports fans Fox and Ziggo. 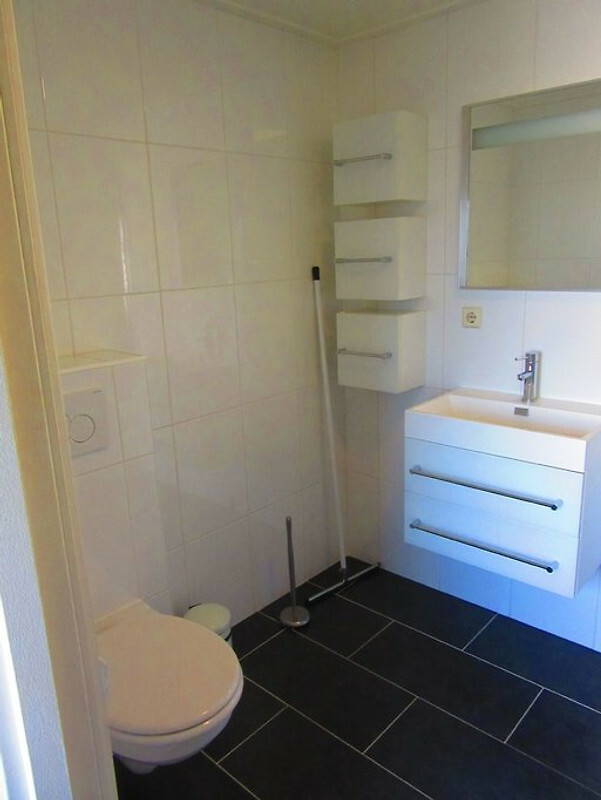 There is also a vacuum cleaner and a freezer. There is also an information folder with tips / excursions and restaurants. The spacious garden is completely fenced so that your dog can walk around freely. The chalet has several terraces, so you can always sit in the sun or in the shade or in the evening on the romantically lit veranda. The friendly, child-friendly family park is spacious and offers you plenty of peace and space to spend a wonderful holiday in Zeeland. There is a restaurant with a nice terrace and a lounge and is located right next to the marina. The marina has an atmospheric and unique clubhouse that you definitely need to go to. You can enjoy the beautiful view over the Oosterschelde. During the season, various activities are organized in the park. Next to the Chalet Park you will find a forest where you can go for a walk with your dog. When you cross the dike behind the chalet, you reach the beach (100 m) where you can swim or sunbathe, and the marina (100 m). Boat rental is possible here. The Oosterschelde is also a nice dive site, location 73 (50 m). Bicycles can be rented in the park. In the village, St. Annaland, you will find a large supermarket (300 m), a real butcher, bakeries, cafes, a local history etc. Every Thursday there is a weekly market. For the kids there is also a nice big playground. In the summer season there is an auction of regional products every Wednesday. You can also do a seal safari from the marina and in the summer season take day trips by boat to Zierikzee. Sint-Annaland is located on the island of Tholen. Nearby it is possible to ride a horse. Within 15 minutes by car you can play bowling, mini golf and there are 2 outdoor pools (seasonal). The area is ideal for beautiful cycling or beautiful walks and there are several routes that take you through the beautiful nature to various picturesque villages and towns. There are several routes that take you through the beautiful nature. It is an ideal place for nature lovers and peace seekers. For the beautiful hiking and biking trails you do not have to drive far, the park is located in the green heart of Tholen and nature is of the utmost importance. The desiccation of the mudflats at low tide, the Krabbenkreek, an offshoot of the Oosterschelde, a feeding place for all kinds of stelt and water runners and all kinds of geese and ducks that they admire from the dikes. The waters around the park offer you the opportunity to practice all types of water sports, not just diving, sailing and surfing, but also fishing is very possible. 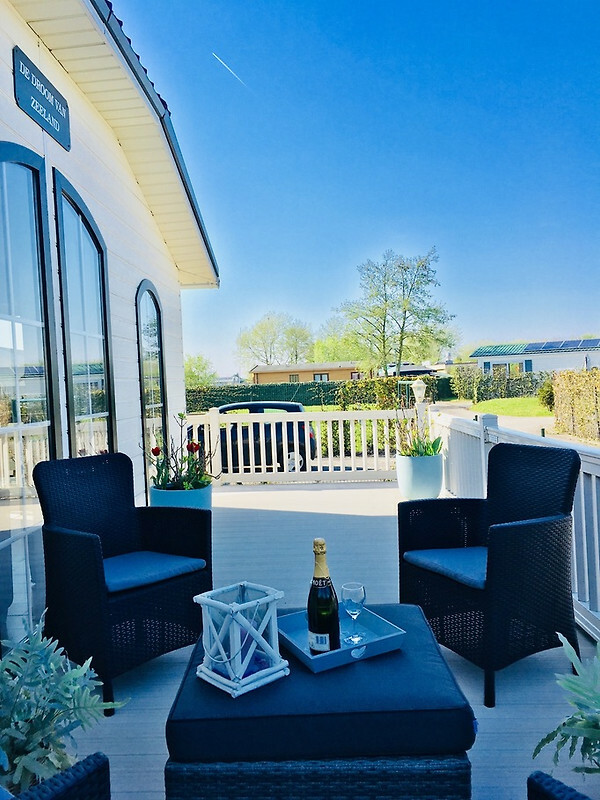 The cottages are located near picturesque Sint Annaland, a lively town with several restaurants, cafes and shops, where you can visit the weekly market next to a supermarket. In the town hall you will find the regional museum De Meestoof, where you can see how the people lived in the Thooler landscape. The oldest mill is the Korenmolen De Vier Winden, a few years ago it was completely restored and is certainly worth a visit. Visit the Watersnoodmuseum in Ouwerkerk. The museum shows an impressive picture of the catastrophe of 1953, which marked the history of Zeeland and the Netherlands. The disaster was the immediate reason for the implementation of the Delta Plan. Especially the south of the island Tholen had a hard time during the catastrophe, in Stavenisse most of the deaths were regrettable. To prevent the catastrophe of 1953, the Delta works were carried out. The Delta Park Neeltje Jans gives you an impression of the works and the power of the sea. But not only the technology can be seen here, there is also a sea lion show, an aquarium and a water park. Something for everyone, young and old. A bustling city full of energy can be found in the many shops located in the medieval streets and squares. Bergen op Zoom has an 800-year-old history and in the city center you will find many monuments such as the Gevangenpoort, the Sint Gertrudiskerk, the Markiezenhof and the town hall. In addition to the many shops where you can cuddle, you can relax on a terrace or enjoy a meal in one of the many restaurants in the city. There is also a nice indoor pool for many hours of water fun! The nickname of Goes is the shopping district of Zeeland. There is a large selection of shops around the historic city center. Goes also has several galleries and you can not skip the Museum de Bevelanden. In the evening, you can visit one of the nightclubs or cafes, where live music is played regularly. The city of Tholen is located on the border with Noord-Brabant. It has a historic city center that is still largely surrounded by ramparts and west. A journey into the past with a visit to the Grote Kerk, the town hall or the historic shipyard at the marina. This great city has everything a city has to offer, many historic buildings and monuments such as the Onze-Lieve-Vrouwekathedraal on the Groenplaats. Or if you prefer shopping on the Meir or you want to visit one of the many museums, anything is possible. And do not forget the Antwerp Zoo, one of the oldest zoos in the world. The many cycling and hiking trails along the meandering polder roads lead you along dikes, fields and viewpoints over the Oosterschelde and the Grevelingen. You will be transported in time past the simple and picturesque villages where you can still taste the history. The surrounding water offers many opportunities for a more active holiday. The choice is yours! Prices are excluding bed linen 7 Euro per person per stay and a Euro tax per person per day. Optional towel package to book, € per person. It is also possible to book breakfast delivered to the chalet. Ask about our possibilities. We are Ad and Diana and we live in the cozy village of Sint-Annaland on the island of Tholen (Zeeland). We hope to welcome you in our chalet! Das Chalet von Familie de Keizer lässt wirklich keine Wünsche offen! Wir haben eine wunderbare Ferienwoche verleben können, was auch am tollen Chalet und der Gastfreundlichkeit von Ad lag! Vielen Dank noch einmal!! Ein ganz tolles Chale, wir haben uns super wohl gefühlt. Das Chalet ist liebevoll eingerichtet und dekoriert. Die Gastgeber sind sehr freundlich. Ganz kurze Wege zum See und zum Strand. Kurz gesagt war es ein super erholsamer Urlaub. Wir kommen gerne wieder und haben schon für nächstes Jahr gebucht. Vielen Dank. Wir freuen uns auf Ihren Besuch im nächsten Jahr.